Content calendars are a great way to manage all of your content and remembering any important dates that you might have. It is also a great way for hotels to plan their content for their social media channels ahead of time since hotels are always busy dealing with other matters. Having all of the content visually laid out on a content calendar will allow you to see where all of your content is distributed, and add any additional content if you feel like more content is needed. One of the primary goals of having a content calendar would be to plan your content ahead of time so that you can maintain the flow at which you publish your posts on to your social media channels. So now that the importance of a content calendar, how exactly do we build one from scratch? Depending on how active you are on social media, that factor alone should decide on how your calendar should look like. Creating a content calendar for each month would be a great start, since you can be able to see what days your posts will go out and such. 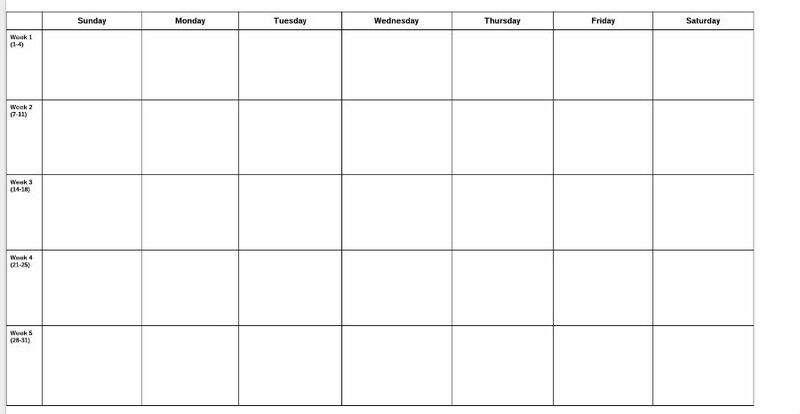 Here is an example of a basic content calendar template, with all of the days of the week laid out. The dates are listed on the side so you know which days the content is for exactly. A good content calendar should contain all the information that you plan on posting, and it should be easy to read. If there are several people working on the same content calendar, the responsibilities should be clearly divided so that everybody can contribute accordingly. Sometimes finding content relevant to your hotel ahead of time can be a difficult, so it’s important to pick only topics that you know your guests would find valuable. In addition to adding holidays and special offers, there are usually a lot of events happening around your hotel so be sure to mention those. Do keep in mind the target market of your hotel, because not every event near your hotel is worth mentioning if it doesn’t appeal to the target market. With the popular hashtags such as #ThrowbackThursday or #TravelTuesday, this allows you to post a wide range of topics that would keep your audience interested. When choosing what content to post, keep in mind the 80/20 rule where 20% of your posts can be about self promotion and the rest should be content about everything else. Certain social media channels require more activity than others, so there should be a posting schedule for all of the content. For example, you would post more often on Twitter than you would Facebook due to the nature of Twitter. Do some research and find out which times would be the best to post your content so that it will reach a wider audience. Excel or Word are two common programs for content calendars to be created on. Depending on how you want to distribute your content, you should create a content calendar that fits your needs. If you do not wish to create your own, the internet has a lot of good templates for you to start out with. If you still do not have a content calendar after this, then now is a good time to start using it.